The TrebbinLab investigates ultrafast protein dynamics and the nucleation & growth of nanoparticles, so that, one day, we can control them systematically. Modern Microfluidic Reaction Systems, Controlled Radical Polymerization, Amphiphilic Self-Assembly, Biocompatible Materials, Time-resolved X-ray Scattering Methods. 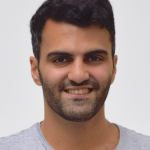 Mohammad Vakili graduated with the Masters degree in Nanoscience from the University of Hamburg in 2015, with a semester of research based at the University of Sheffield in England. He is currently pursuing his PhD in the group of Professor Martin Trebbin and his research activities include the development of microfluidic devices for nanoparticle synthesis and the investigation of reaction kinetics in microfluidic geometries.